Top Diameters: 42", 48", and 54"
Pictured in optional two tone finish. Two tone finishes need to be ordered by phone. The Arts & Crafts Pub table features gracefully curved legs and mission slats that gives this table it's unique detail and character. It's trestle-leg hybrid design lends extra strength and stability over leg based pub tables. Strength is a desirable feature for a pub table that may see it's share of strength and durability tests through out it's life. The black painted base with stained top is yet another example of the many ways our tables can be custom tailed to suit your design needs. Every table we offer is Amish hand crafted with meticulous attention to detail. Customize your Amish dining table using drop-down boxes (shown top right). Entertaining has never been more appealing than with a beautiful table. The solid construction and design allow this table to fit into any sized home. There is also a 42" tall version of this table available. The fantastic size is combined with simple yet understated design. Top Diameters: 30", 36", 42" and 48"
* This table is not able to self store any leaves. The Bistro is the most elegant of pub tables on the market. The center pedestal is accented by a graceful turn detail and sweeping arched base. It is pictured with black painted base and stained Red Oak accented top. Height: 30", 36", or 42"
Pictured in brown maple with White paint and Gold Bottom Plate. Pictured in rustic cherry with WS2B10 with warm brown glaze. Width & Length Sizes: 36" x 42", 42" x 42", and 42" x 48"
Design your pub to impress with this modern yet handcrafted table. The combination of Mission slats and contemporary curves and angles creates a midcentury modern table. Built of solid hardwood, the Brookville can withstand decades of exuberant guests. *This table is not able to self store any leaves. Pictured 54" Round in rustic quarter sawn white oak with Golden Brown stain. Base color will turn out darker than top due to aged wood. Top has 4 metal brackets that will need adjustment upon delivery. No two barrels are the same. Every table will need special adjustment. Customize your Amish table with options in our drop-down boxes (shown top right). 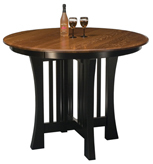 The Craftsman Mission Pub table beautify exemplifies the Mission style. It is designed with 1" thick top, Mission edge, corbels and a slatted pedestal. The pictured Fireside Rustic Kitchen Bar is built in aspen with natural finish. Invite the outdoors in for dinner with you with the Glacier Country line. Each table leg has the look of freshly sawn logs, while the skirted table top keeps this rustic table simple. The Glacier Country Four Post Dining Table with Leaves has giant log legs for prominent rustic style that is durable enough to take leaves. The logs still show some bark, and the top is finished in elegance. Enjoy country living in luxury with a rustic bistro table. The rugged legs of this table look like they grew for you in your dining room. It's a great match for the separately sold bar stools. The Glacier Country Cocktail Table with Shelf has dark and rustic log legs, a thick table top, and an extra shelf for function. Distance between Legs - 30"
A table with style, the Glacier Country Pub Table has gracefully carved feet, a thick pedestal with half log accents, and an angular top to perfect a rustic social setting. A rustic dining room can do with the simplicity of this square table with log post legs. This gorgeous table has log style trestles supporting a rectangular top. Mortise and tenon joinery makes this an heirloom piece. The price is a bargain for such a beautiful and durable table. Give your kitchen a country pub look with this pub table. This table's simple construction allows it to expand for entertaining, unlike many other pub tables. Twig textures and elegant hardwood combine in this versatile rustic pub table. This pub table is tall enough to show off its hickory legs, while the windmill center lends leg and chair space to an action-packed evening. Perfect for a summer home or rustic bar. 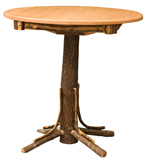 This pub table has a log pedestal and twig feet for a rustic texture, but there's more. The twig skirting adds even more flair to this solid wood table. This round pub table has a hickory log pedestal to contrast its elegant, functional top with its rustic flair. Too add fun and function to any country space, add a hickory pub table.